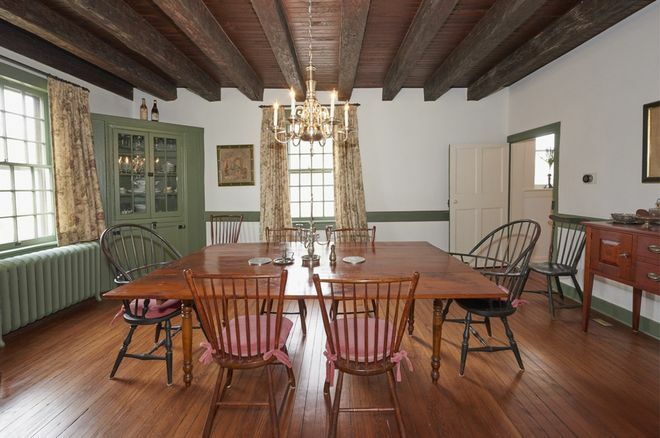 This incredibly beautiful farmhouse, known as The Hartshorne House, was built in 1664 in Middletown, New Jersey. It is recognized as one of the oldest homes in the state! What's more, historians have called it one of the most important Dutch structures currently still existing in the United States. With a backstory dating back over three centuries, one could assume that this home might be in rough shape...and just the opposite is true. 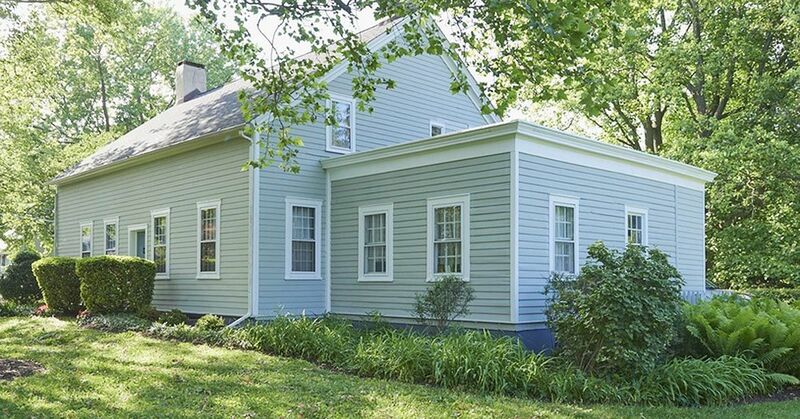 Thanks to careful restoration over the years, this gorgeous country home is more beautiful than ever! This farmhouse comes with over an acre of well-maintained lawns and gardens that are just lovely. Plus, it's located close to the nearby beach! 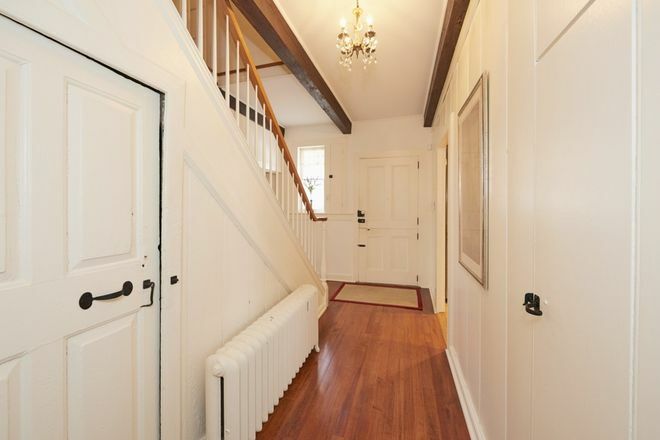 Clean white decor in this hallway allows the rich hardwood floors to take center stage. An elegant chandelier light fixture adds extra polish to this space. 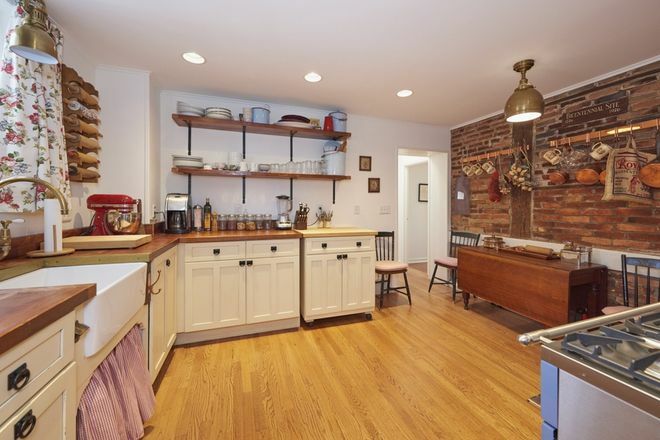 One of the many one-of-a-kind features that can be seen in this house is the exposed brick wall in its open, spacious kitchen. This lends itself perfectly as a rustic backdrop for displaying copper cookware and dried flowers. 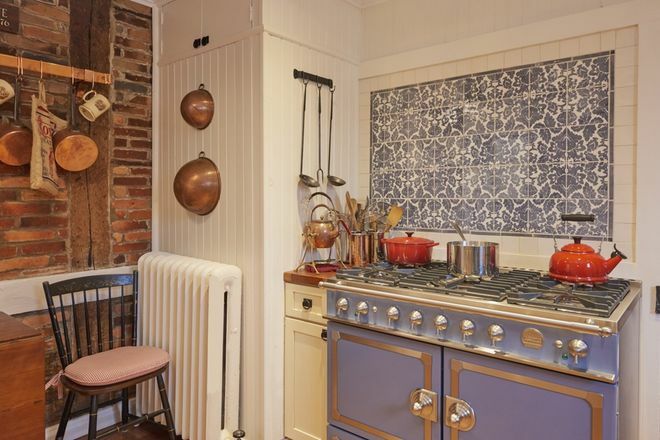 The tile behind this home's stovetop is absolutely incredible! It's special touches like these that make this house so unique. This kitchen also features a butcher block and top of the line appliances befitting of even the most acclaimed chef. 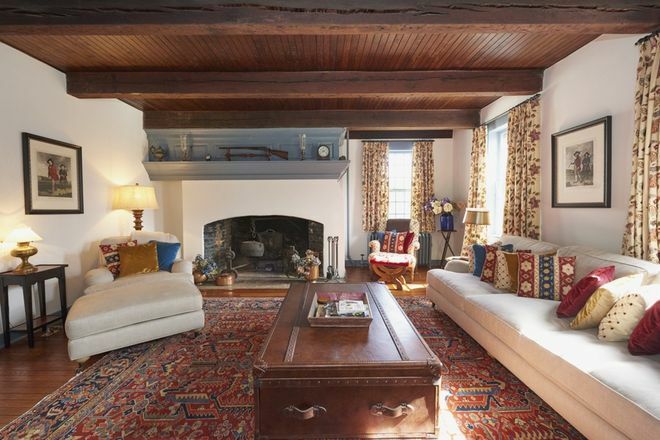 The living room in the Hartshorne House features an original fireplace to help keep you warm on chilly winter nights. The hardwood beamed ceilings contribute additional cozy, rustic style to this oh-so-comfortable room. 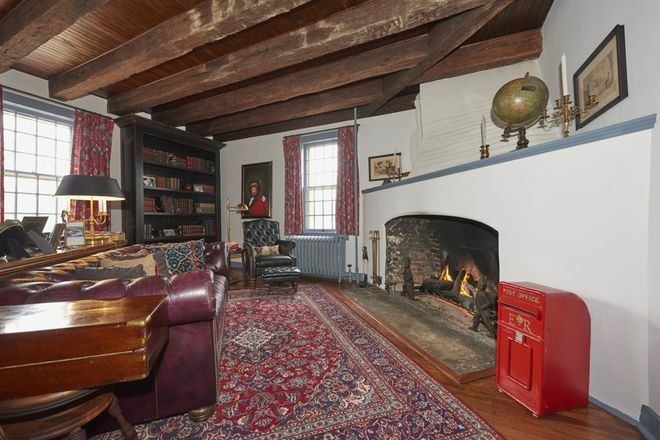 A second fireplace can be found in this room, which is the perfect home library or study! Rich wood finishes combine with luxe leather to create an aesthetic where old world opulence blends with classic country charm. A formal dining room is a great space to host holiday dinners and big family get-togethers, and this room is fit to host it all. The gleaming chandelier light brings out the rich tones of the hardwood ceiling beams, while unique built-ins such as the original china cabinet seen here can be used to store heirlooms and antique china. 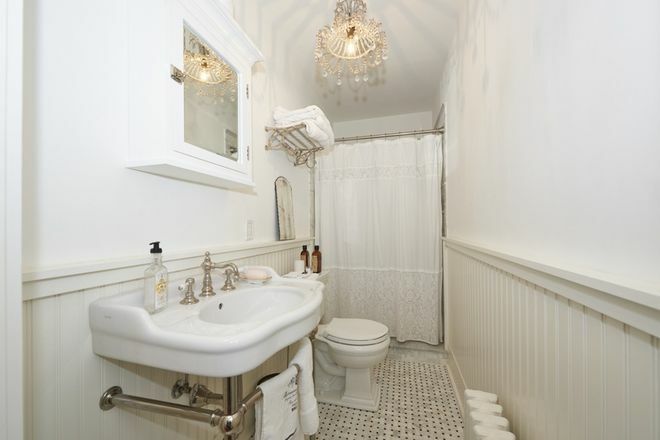 This sparkling all-white bathroom is both clean and luxurious. With classic waterworks fixtures, this bathroom captures antique country style and melds it with twenty-first century comforts. 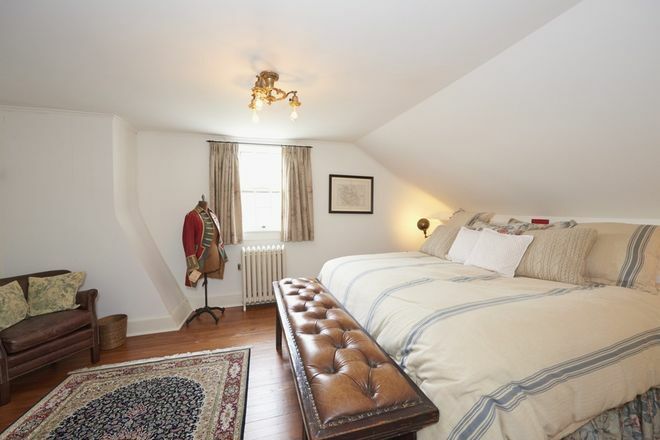 The lines of the fireplace give this large bedroom distinctive dimensions that only add to its existing charm. An upholstered leather bench offers extra seating as well as a good storage solution for visiting guests. Finally, the dress form bedecked in colonial attire is a quirky and charming nod to the home's historic past, and a great addition to the room's decor. Do you love this home as much as we do? Share it with your friends!